My sister Brooke is a world traveler. When I told my family I was moving to Europe, she was by far the most excited. The day I left the USA she flew from Minneapolis, Minnesota to Atlanta, Georgia to surprise me during my 30 minute connection. She was the last hug goodbye I recieved before leaving the country I loved so much to chase my dreams on the other side of the ocean. I had tears in my eyes when I left but I knew without a doubt she would come adventuring with me. After narrowing it down to a few places we decided on Rome, Italy. (I’m slightly biased because Italy is my favorite country in Europe thus far). So we packed our bags and made plans to meet in Rome. Daniel and I were exhausted from working, not sleeping and packing last minute. When we arrived to airport we took a shared taxi/van (much cheaper than taking an individual taxi… yet not as complicated as catching a 40 minute bus ride then navigating the subway system and randomly guessing which stop was closest to the place we rented.) If you can find one of these van taxis you can save money and still feel stress free about traveling to your accommodations. 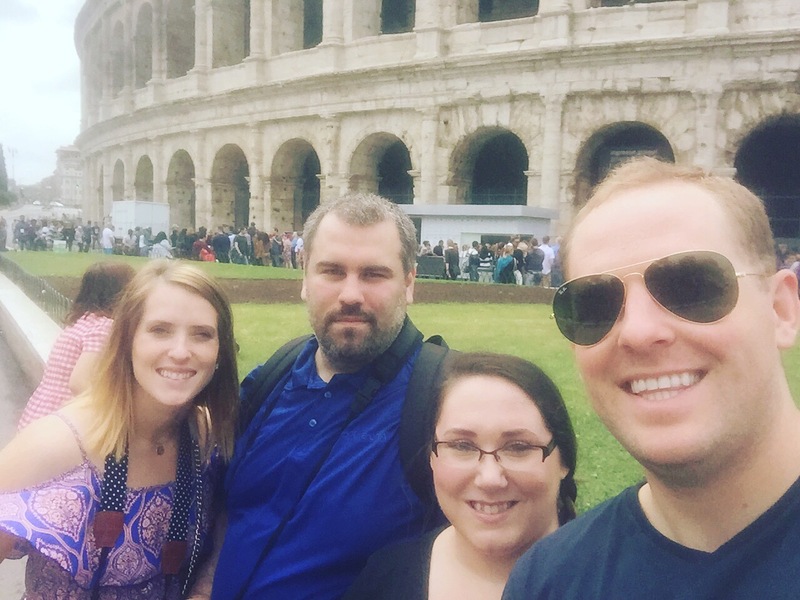 Like usual, we chose a few big things to see while we were in Rome. Brooke chose the Trevi Fountain, Matt chose the Vatican and I chose the Colosseum. We started at the Colosseum and worked our way through the city. It’s no secret that history is my least favorite subject even as an adult. However, I learned a TON about Roman history throughout our tours of the Colosseum and the Vatican. I could spend this entire post regurgitating facts that I learned but I would hate to bore you (they have history books for that!). One thing I’ve learned while traveling is that some things you just have to see with your own eyes to make history feel real. 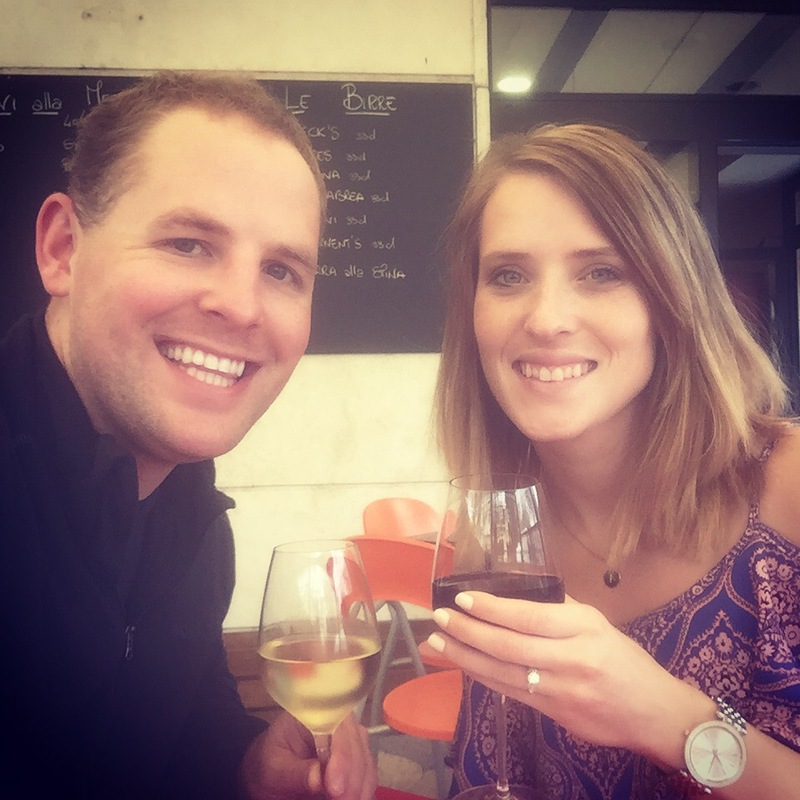 I wanted to share a few of my favorite things about Rome, travel and love instead. 1.If you like to travel on a budget (like we do) check out Airbnb for great deals renting entire apartments instead of hotel rooms. This is our second experience using that website and we really loved the 2 bedroom 1 bathroom apartment we stayed in. It was close to a subway stop and very affordable at 45 Euro a night. 2. Drinking wine for breakfast is completely normal. If you’ve ever drank Italian wine… you’ll never want to go back! This little cafe was located right below the apartment we stayed in. They had the best hot chocolate. It was very similar to a warm melted chocolate pudding consistency. We couldn’t get enough of it. 3.Meeting my sister Brooke and my brother in law Matt on this side of the world was an unforgettable adventure. They were truly amazing travel partners. I recommend choosing relaxed and flexible people to travel with, you’ll have more fun this way. 4. I would highly recommend seeing the inside of the Colosseum. It was well worth the tour price. Dan and I are pretty spontaneous so we are not obsessive travel planner type. We enjoy minimally planning and picking places to see/eat at once we get there. (You never really know what mood you’ll be in when you arrive. You may want a long walk and a beer or a two hour nap.) We bought our Colosseum tickets when we got there and avoided the ticket lines by using a guided tour service. We learned so much about the Roman Empire and the history surrounding this gorgeous historic city. 5.Brooke, you always bring so much happiness to my life and I’m so thankful for your friendship. (we couldn’t seem to stop smiling this trip– or maybe it was the wine 🙂 I caught you off guard here but you just looked so happy I couldn’t help but include this one. 6. After the tour of the inside of the Colosseum we had an hour and a half break. We chose to grab lunch. If you’re going to walk this many miles in one day, it’s important to make time to eat. Nobody likes traveling with a hangry person. (Hangry=angry because you’re hungry). 7.After lunch we met back up with our group for the Palatine Hill tour. Our guide Camilla was so funny and sweet. I thoroughly enjoyed her presentation. I even stopped taking pictures and let Dan use my camera so I could enjoy looking around. I was pretty impressed with his photography skills. (Minus a few extra pictures he snapped of the floor, my legs and some random woman’s shirt haha). 8.Don’t forget to pack your sunnies. It seems like everytime we go to Italy either Dan or I forget them. I wore his occasionally throughout the day until I finally bought a cheap pair. 9. Pack light layers you can add when you get cold. I wore a dress and packed leggings to throw on once the sun went down and it got chilly. 10. Carry a crossbody purse. Pick pockets are pretty bad in crowded places like the subway. Thanks Meg for the recommendation!!! This one is from Rebecca Minkoff. (I wanted the white one but I snagged this grey one for 99 cents on Amazon. I used my AMEX reward points AND it was on sale. I’ll count that as a fashion win.) It held all the minimal essentials: passport, wallet, phone, keys and lipgloss. It was the perfect size for our quick trip to Rome. 11. Take the time to enjoy the things you didn’t intend on seeing but happen to run into. The amount of marble that is used in Rome was astonishing. I felt like everything was covered in this beautiful white marble. 12. The Trevi Fountain was outrageously crowded. I would recommend going during the day in off season. You’ll get a better views and you won’t feel so claustrophobic with everyone touching you on all sides. 13.We spent time walking through the small alleys and I finally bought some sunnies near this one! Remember to negotiate your prices with the street vendors. If they can get you to pay double what the product is worth they will and beware… the people selling selfie sticks were pretty aggressive. We finished out an extraordinarily long day of walking with dinner and drinks in front of the Pantheon. The thing about love is… When you leave, a piece of me leaves with you. Ps. Once again, espresso has us falling in love all over the world! Burg Lichtenberg: The not so dirty Thirty! I love your writing style Jenny! And your photos are gorgeous! Love that we have been to some of the same places! Next time we find our way across the ocean, we should all meet up somewhere for a day and catch up! Thank you for reading! I loved hearing all about your honeymoon especially because Italy holds a special place in my heart. 🙂 I would LOVE to meet up and travel with you guys. Come any time!